Score A Victory Against Hunger! 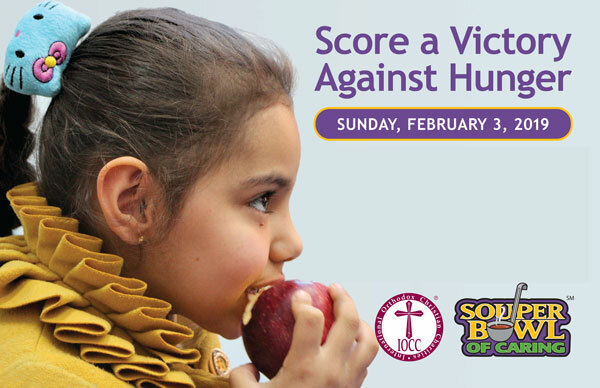 Rally your parish and church youth and team up with IOCC this Souper Bowl Sunday. Just follow the simple guidelines to lead your youth towards becoming Souper Bowl MVPs! 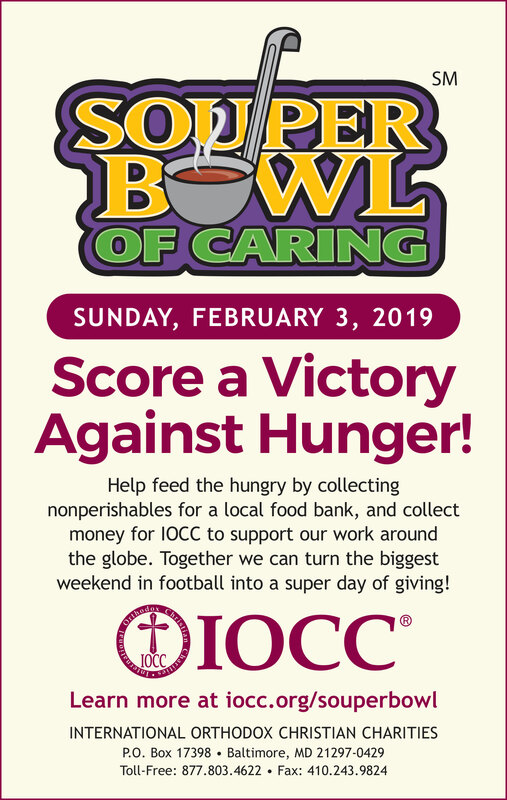 ANNOUNCE that your parish will be part of the Souper Bowl of Caring, and ask parishioners to bring a nonperishable food item and small monetary contribution to Liturgy on Sunday, Feb. 3. DISCUSS the Souper Bowl with your youth group. Lead them in a discussion on community service and serving the poor. Read the Parable of the Good Samaritan in the Bible (Luke 10:25-37), and relate the teaching of "helping our neighbor" to Souper Bowl service activities. DECIDE to which local food bank or soup kitchen you will donate the nonperishable foods collected on Souper Bowl Sunday. 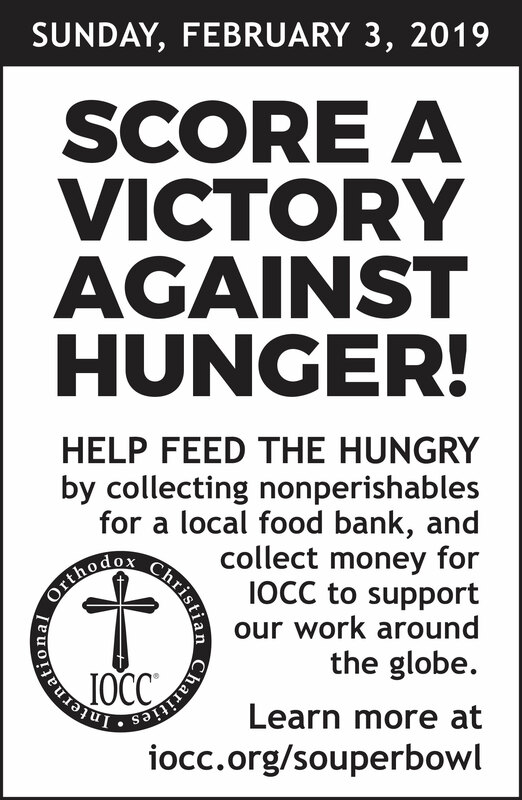 CHOOSE a monetary goal for your parish to raise for IOCC, and collect funds on Souper Bowl Sunday. COLLECT the donations on Sunday, February 3. After services, the youth should stand at exits with large soup pots to receive the donations. Other young people can help pass collection trays at the appropriate time. DELIVER nonperishables to a local hunger-relief charity in your area. 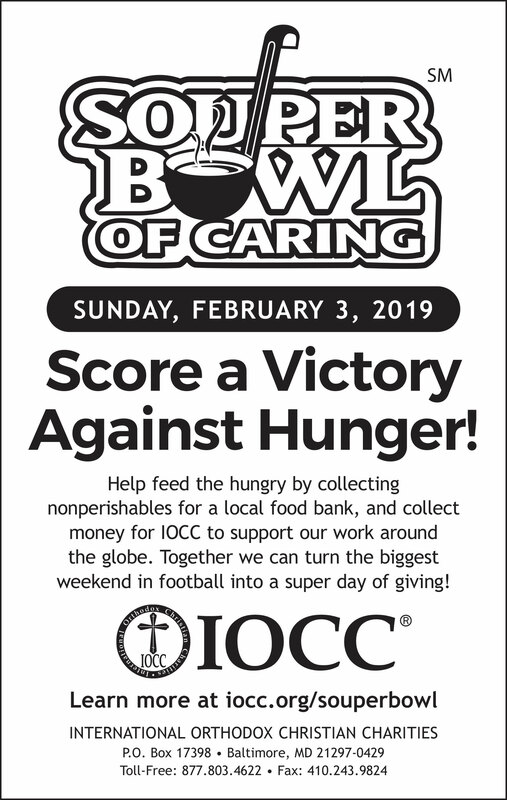 MAIL checks to IOCC using the Souper Bowl Sunday mailer your parish received. DEBRIEF your Souper Bowl experience with the youth to reinforce the messages of service and volunteerism. 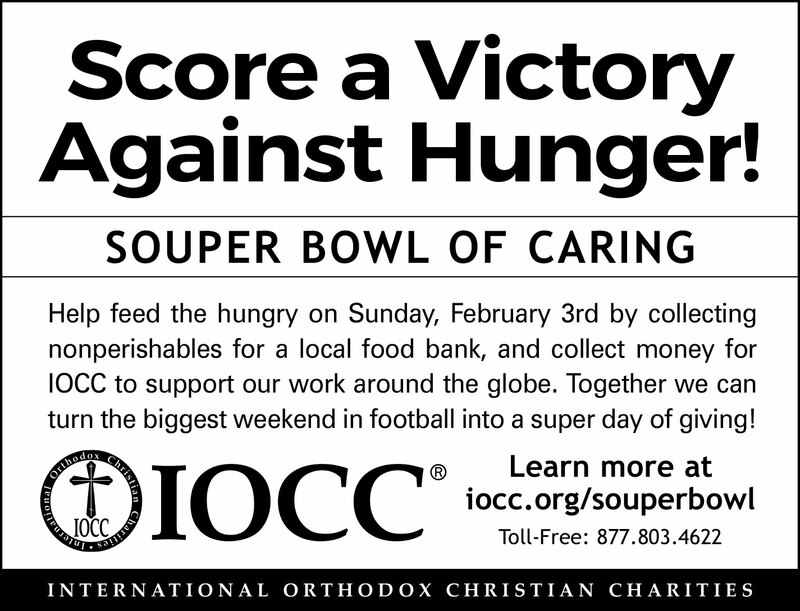 Your monetary contribution to IOCC on Souper Bowl Sunday will help people in need across the globe. Your gift of $90 is enough to provide an affected Syrian family with a water tank to store clean drinking water. Your gift of $250 can help cover one primary or kindergarten teacher's salary so they can continue teaching those in need. With $430, IOCC can provide one hearing aid to enhance a hearing-impaired Syrian or Jordanian child’s ability to succeed in school and, ultimately, society. Your gift of $900 is enough to cover one participant's cost, allowing the next generation of Orthodox Christians to grow in their faith as they put it into action.